Yesterday 1.3 million jobless Americans lost their unemployment benefits, thanks to Congress’s unwillingness or inability to extend long-term unemployment insurance funding. The number could rise to 4.9 million within the next year. Extending the unemployment benefits is a no-brainer at a time when long-term unemployment rates are still higher than in any previous postwar recession, when there are three unemployed people for every job vacancy, and the money paid out in unemployment benefits quickly gets spent, thereby boosting the still-weak economy. Support for the extension is strong among the public, liberal public policy groups, and even some prominent conservatives. But Congressional Republicans continue to block it. I’ve heard four arguments against extending unemployment benefits beyond the current 26-week threshold. A recent empirical study published by the Brookings Institution estimates that in the absence of extended unemployment benefits the unemployment rate would be about 0.1 – 0.5% lower, which we will note that is a small fraction of the current 2.6% long-term jobless rate. And the author notes that about half of that improvement would come not from the long-term unemployed rejoining the work force but from currently employed people sticking with their jobs because of the worsening of the alternative. So the estimate becomes just 0.05% – 0.25% of the long-term jobless who would rejoin the work force if benefits were cut off. Do the math, and the estimated ratio of still-unemployed people without benefits to newly re-employed is in the range of 9-to-1 to 51-to-1. Rather high pain-to-gain ratios. 2. It hurts the long-term unemployed by lengthening their term of unemployment even further, making it even harder for them to find a job. While it’s true that employers are reluctant to hire the long-term unemployed, this argument makes the same false assumption as in (1. ), namely that the jobs are out there and the long-term unemployed just aren’t looking hard enough or aren’t willing to take them. A 3-to-1 unemployed-to-vacancies ratio should give the lie to that. And the ratio of long-term unemployed to vacancies that long-term unemployed people have a realistic shot at is surely much higher. 3. It’s no longer needed, what with the economy’s recent improvement. Real GDP grew 4.1% in the last quarter, and the unemployment rate is down to 7%. Those numbers have dominated the recent headlines, but they’re irrelevant here. Thanks to growing productivity, real GDP is now higher than it was before the recession, but with two million fewer workers. And as I seem to write in every post, the standard unemployment rate is largely irrelevant, when millions of jobless Americans have given up looking for work, millions more have left or avoided the labor force entirely, and other millions are involuntarily working part-time because they can’t find full-time work. More relevant numbers are the 13.2% comprehensive (U-6) unemployment rate; the 58.6% employment/population ratio, which has not improved since the depth of the recession; and, of course, the 2.6% rate of long-term (27+ weeks) unemployment as a percentage of the labor force. The economy’s recent good news has largely bypassed the long-term unemployed. The best that can be said about the long-term unemployment rate is that it’s been coming down, from about 4.3% four years ago, but even then it’s still as high as at any point since the 1940s. Whatever your opinion on this issue, there should be no doubting that long-term unemployment is one of the central problems of our time. The long-term unemployed are almost 40% of the total unemployed, which is roughly twice as high as in any previous postwar recession (see graph). While extended unemployment benefits do more good than harm, what we need even more are jobs. Government job creation is a non-starter in Congress and apparently with the public as well, so once again we are left with the Micawber-like hope that something will turn up in the private sector. Six years ago this month, the US economy officially peaked. We didn’t know it till a year later when NBER made the call, but the labor market has never been the same. The unemployment rate crept upward through the summer of 2008, before exploding that fall and reaching double digits the next fall (up from 4.5% in the first half of 2007), several months after the recession officially ended in June 2009. People call that devastating eighteen months the Great Recession, but I prefer to call this whole six years (and counting) the Little Depression because the economy — and the labor market in particular — remains so depressed. The adult (age 16+ population) grew by 13,411,000. Sometimes the numbers really do speak for themselves. In other words, a lousy labor market is good QE-bait. What accounts for the German labor market miracle? I’ve been pondering this for a while now. First, is this miracle for real? In the US, for example, the official unemployment rate has lately been falling, yet the employment-to-population ratio has barely budged, largely because fewer people are entering the labor force (i.e., getting jobs or looking for jobs). Yet Germany’s labor force participation rate and employment-to-population ratio have been increasing. Has Germany suddenly changed its definitions of who is unemployed or not in the labor force? Apparently not, and it wouldn’t matter anyway, as these numbers are the International Labor Organization definitions of unemployment, the same as the US uses. Also, this is a fairly long-term pattern, back to 2005 (coincident with, though not necessarily caused by, Angela Merkel’s term as Chancellor following the 2005 elections). nearly one-in-five German workers is in a tax-exempt mini-job, earning €450 a month or less. A government survey a few years ago found that nearly a third of mini-jobs workers were looking for a job with longer hours but were unable to find one. Let’s do the math. <20% * <(1/3) = employment rate of 94.6%. Subtract 6% of 94.6%, and you’ve got 88.92%, or an unemployment rate of about 11%. This is roughly similar to the US situation, where counting involuntary part-time workers as unemployed would add 6.2 points to the unemployment rate. On the other hand, Germany’s “mini-jobs” are more a matter of government policy than their US counterparts. For more, see this Wall Street Journal article on mini-jobs, in which German experts call them dead-end jobs that provide no incentive for employers to move these workers to full-time or for the workers to give up their tax and welfare benefits for full-time work. Balance it out with this other Telegraph article that argues that mini-jobs are a helpful means of providing work. All of this is quite different from the post I expected to write. I was going to mention how the euro’s recent weakness (for the past two years, it’s been down about 10-15% from its 2009 peak) helps Germany’s net exports. It does so both in the usual way and because Germany’s currency is surely cheaper under the euro than it would be if Germany were still on the Deutschmark. Crisis countries like Greece and Italy drag down the value of the euro, while whatever the high demand for German assets as financial safe havens does to raise the price of the euro is offset by reduced demand for other euro-country assets. I was also going to mention Germany’s sluggish population growth and difficulty in attracting immigrants, which have caused the labor force to grow slowly. It’s easier to find jobs for a trickle of new labor force entrants than for a flood of them. Finally, I was going to mention this 2011 National Bureau of Economic Research paper by Michael C. Burda and Jennifer Hunt, which finds the “German labor market miracle” to be real and attributes it to a hiring catch-up on the part of employers who were reluctant to hire early on in the 2000s expansion, “wage moderation” (unions accepting smaller pay increases, apparently), and “working time accounts,” seemingly similar to the “flex-time accounts” proposed by Chamber of Commerce Republicans, that allow employers to avoid paying overtime if the employee work week averages out to the standard amount. Note that the paper (or at least its abstract) does not mention “mini-jobs,” which may mean that mini-jobs are nothing new in Germany and that their use has not expanded much of late (I could not find anything much on the history of mini-jobs in my Googling). All things considered, Germany’s labor market still looks a lot better than that of the rest of the Eurozone (except German-speaking Austria). 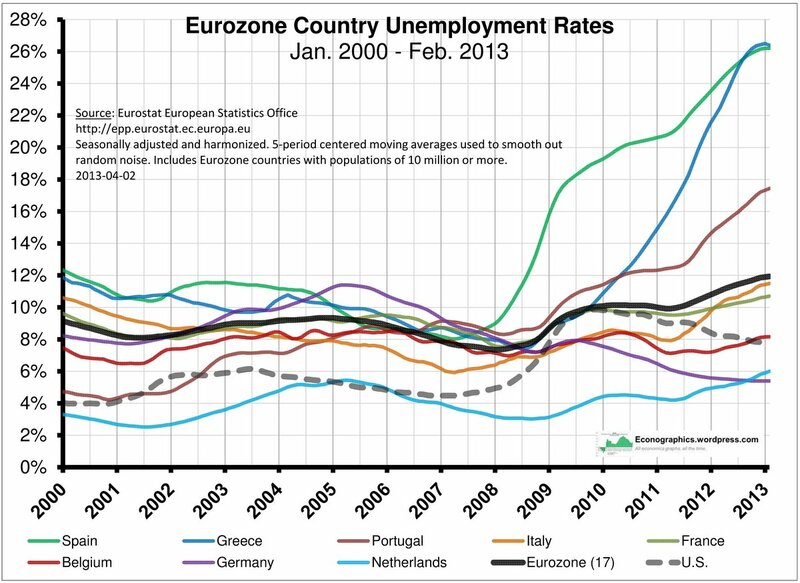 I’d like to see a German equivalent of the comprehensive “U-6” unemployment rate that the US reports every month. My guess is that it would be very high, much like that of the US, but still showing dramatic improvement since 2005. They’re doing something right over there, but it’s hard to tell just what. Another first Friday, another BLS employment report, and the headline news is pretty good: In July the official unemployment rate fell to its lowest level, 7.4%, since 2008. If you were a White House publicist that morning, you could have noted that fact and also that the comprehensive U-6 unemployment rate (which includes discouraged job-seekers and involuntary part-timers) also fell, from 14.3% to 14.0%. And then you could have taken the rest of the day off. The unemployment rates come from the BLS’s survey of households. The BLS’s other survey, of employers (the “payroll survey”), is disappointing relative to the previous month’s. June’s report showed the economy with net job growth of 195,000, plus upward revisions of 70,000 jobs to the previous two months. July’s report has net job growth of 162,000, and downward revisions of 26,000 to the previous two months. At this month’s pace, it would take us a year longer to get back to 6% unemployment than at last month’s pace (using the handy Jobs Calculator of the Atlanta Fed). The stock and bond markets seem to have gotten this report about right. The stock market barely budged, and the 10-year Treasury bond rate actually fell somewhat, from 2.72% to 2.60%, despite the improvement in the official unemployment rate. Both markets watch the employment reports with an eye toward the Fed’s next move on interest rates and “quantitative easing” (“QE”; special purchases of long-term bonds and mortgage-backed securities), all the more so after the Fed recently announced that it would start “tapering” off QE when unemployment falls to about 7.0% and start raising its key interest rate when unemployment falls to about 6.5%. While we’re a notch closer to those rates now, the trend does not look good. Treading water is about all this labor market is doing, and the markets seem to get that. Has the dust settled yet on last Friday’s BLS employment report? The big news was that the economy generated 195,000 new jobs in June, better than expected, and revised data show 70,000 more new jobs in April and May than previously reported. The basic unemployment rate was unchanged at 7.6%, but the new 265,000 jobs were enough to set the media and markets aflutter. Most articles I saw hailed the jobs news as fabulous. The S&P 500 had a good day, up 1.6%. Ten-year Treasury bond rates shot up 21 basis points (from 2.501% to 2.715%), in anticipation of higher interest rates to come, either from the natural forces of higher demand for credit in a stronger economy or from the Fed’s “tapering” its expansionary Little Depression-era policies. The higher jobs numbers are welcome news, to be sure. Using the Atlanta Federal Reserve’s wonderful jobs calculator, at a rate of 195,000 new jobs per month, the US economy would be back to 6% unemployment by September 2015 and 5% unemployment by February 2017. Not great, but at least a visible end of the tunnel. For a long time the math was much more dismal — e.g., not until 2020. With the new revisions, the average job growth for 2012 is actually a bit better than June’s, 202,000. (Which, by the way, is better than in 2010 or 2011.) Plug that into the jobs calculator and we hit those targets three months sooner. This shift from full-time to part-time work may reflect a trend of employers’ increased preferences for part-time over full-time workers; for example, in the wholesale and retail trade sector, since 2006 full-time employment is down 500,000 while part-time jobs are up 1,000,000. Avoiding the “Obamacare” employer mandate for firms with 50+ workers would be another logical reason, and I wonder if this trend is a reason for the administration’s recently announced one-year delay of the mandate. But neither of these trends is new, so I don’t know why June would have seen such a particularly huge shift to part-time. We see the same pattern in my favorite alternative unemployment rate, the U-6 unemployment rate, which includes part-time workers who would prefer full-time work and “discouraged workers” who want a job but have given up looking. Unlike the standard unemployment rate, which stayed at 7.6%, this comprehensive jobless shot up from 13.8% to 14.3%. Part of the rise was due to more discouraged workers, but most of it was from an increase in involuntary part-timers. Overall, not a great employment report. It’s possible the household survey, which economists tend to regard as less reliable than the payrolls survey (even though it’s the one we use to derive the all-important unemployment rate), was just weird this month. For the past 12 months as a whole, we do not observe a shift from full-time to part-time work. The net increase in jobs was 2.4 million, and slightly under 10% of that was part-time jobs, about the same as for the labor force as a whole (i.e., including old and new jobs). The bond market may have taken a while to digest the ambiguous nature of this report, as long-term Treasury yields, after rising sharply on the Friday of the report, lost half of that increase in the next week. The stock market continued to boom, perhaps because they see the rise in part-time employment as promising greater flexibility and profitability on the part of corporations. But of course these prices change for a lot of reasons. The wage is too damn high? I don’t think so. But first, some background. President Obama proposed raising the minimum wage in his State of the Union address. Specifically he called for it to go up to $9 an hour by the end of 2015, up from $7.25 now, and then to index it to the rate of inflation in subsequent years. Is this a good idea? Economists are famous for being against the minimum wage, with introductory microeconomics textbooks typically using it as an example of a price floor that creates a surplus of the good in question – in this case, a surplus of labor, or unemployment. And that is valid if the market for labor is perfectly competitive and if the rest of the economy is held constant. (Two rather big ifs, yes.) Economists call this “partial equilibrium analysis,” as opposed to “general equilibrium analysis,” which looks at the repercussions in all markets. In the economy as a whole, firms can’t always sell all they want to at the going price, and too-high wages are not the only source of unemployment – recessions cause unemployment, and so does falling demand in specific sectors of the economy. It’s also possible that higher minimum wages could increase the total income of the lowest-paid workers, resulting in more demand for goods and services in general and a higher level of employment. The White House clearly believes that last part (more about that here). Who’s right? It all depends on which effect is stronger – the micro effect (higher wages mean less output and employment) or the macro effect (higher wages mean higher incomes and higher aggregate demand). And that is an empirical question. For decades, most economic studies found that minimum wages reduced employment among the least educated, least skilled workers, i.e., the people most likely to be working at low wages. But an influential study by economists David Card & Alan Krueger in the 1990s found either no effect or, surprisingly, a positive effect of higher minimum wages on low-skill or teenage employment. In their 1995 book, Card & Krueger further found that the earlier studies omitted important variables, like teenage high school attendance rates, and that controlling for those variables caused the minimum wage’s estimated effect to be insignificant. Their work has had its own critics and would-be debunkers, but it remains influential.